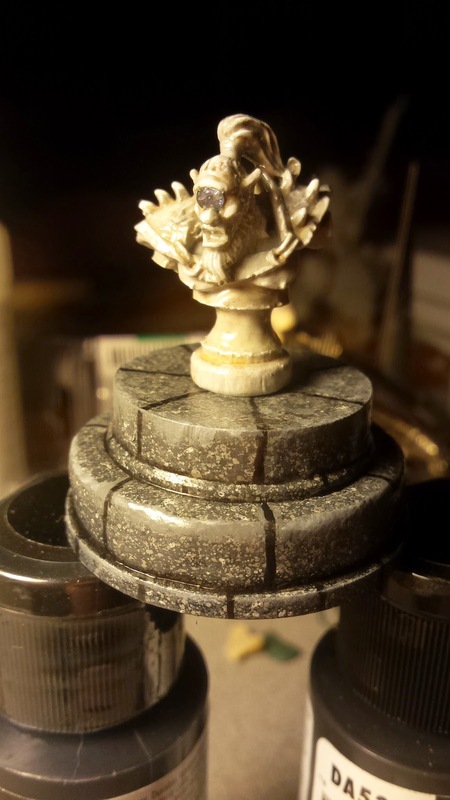 Brush Wizard: WIP: The Great Cyclopean Gemstone Heist! - Making the busts. WIP: The Great Cyclopean Gemstone Heist! - Making the busts. Alright, alright. We're back to the WIP posts... But its only because, thanks to Twitter, I've gotten a great deal of inspiration in the diorama department. 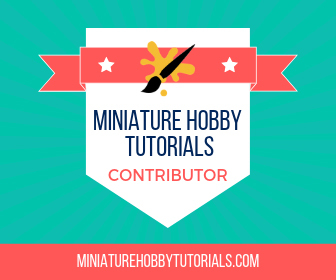 And since these projects are intricate and take a lot of time, we're going back to WIP posts. If you've been following on Twitter, you already know that I've started a new project, and you'll have seen a great deal of progress shots already. This project will be a couple of thieves attempting to steal a jewel from the eye of a Cyclops bust in a museum. The gemstone is a old earring jewel and will be lit with a LED tea candle light from below. While the museum will be a diorama with a wall on the back side of it, lined with busts and framed artwork hanging on it. The idea for this came about thanks to 2 separate guys on Twitter. The first was minisbytree, who is working on a super sweet Batman diorama, complete with 2 walls and a nice back alley scene. It really made me want to branch out from my usual grass and stone bases. 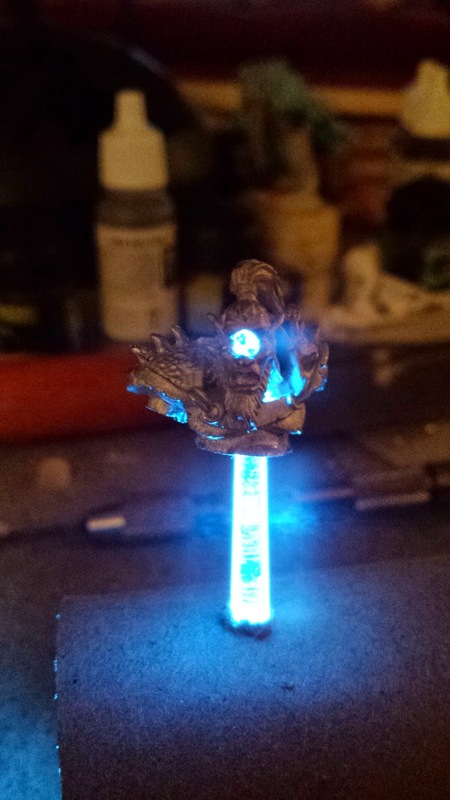 The second, was blue_cadet, who made a really cool Warhammer 40k objective marker using a LED tea light, and it really got me thinking about using one for a project. As the Keeper project was winding down, I started planning this next one. 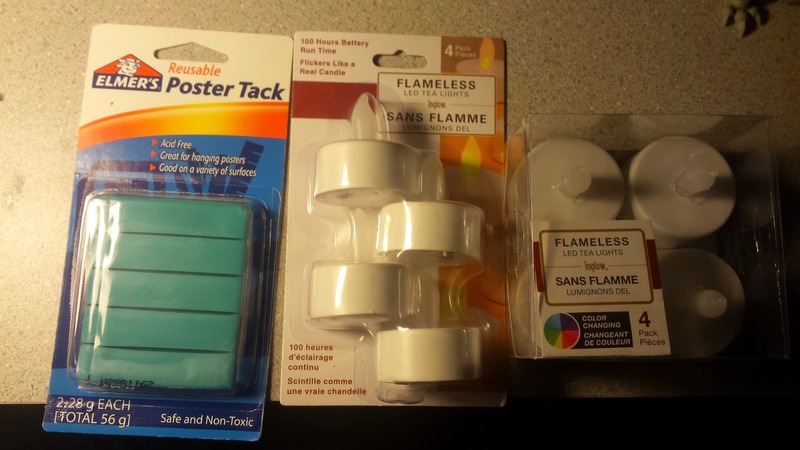 I picked up some supplies to play with, including 2 types of LED tea lights and thumb tacks. I've since decided to go with the color changing tea lights, instead of the flicker candles... the flicker ones just didn't seem bright enough. While the thumb tacks will be used for bases of the other busts. So far, I've already knocked out a lot of work. I took some of my Kickstarter Bones, along with a metal mini I really liked and cut them down to just torsos. Then I cut the tops of the thumb tacks off, drilled and mounted the minis to them and with a little bit of green stuff, blended them together. There was a little mishap when priming them, and they ended up looking slightly rough, thanks improperly shaking the can of GW Skull White spray. But I think it worked out in their favor after they'd been fully painted. It helped give then a bit better look. The Cyclops was originally a regular mini as well. But I chopped him off at the chest and lopped off his arms. Then I drilled him out by hand and using a fancy wooden piece, I made base for him as well. But, since he's going to be in the middle of the room, he needed a different lower base to rest on. 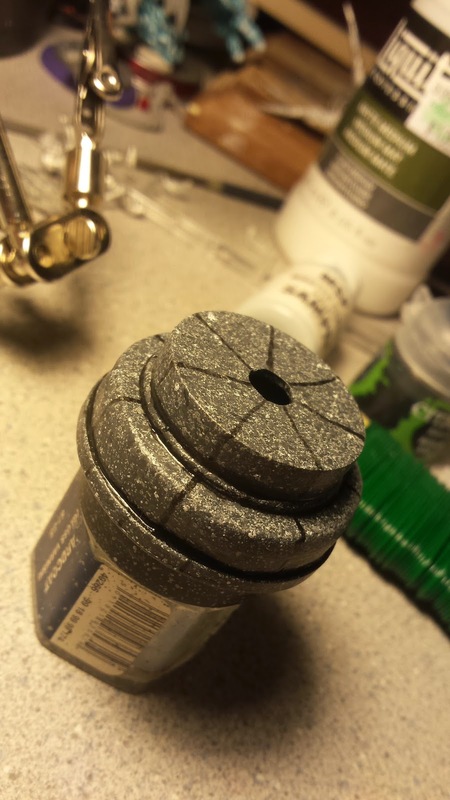 So, I took a medicine bottle cap, cut off the threads and covered a bit of it with green stuff. After a bit of sanding, you can't even really tell what it originally was! 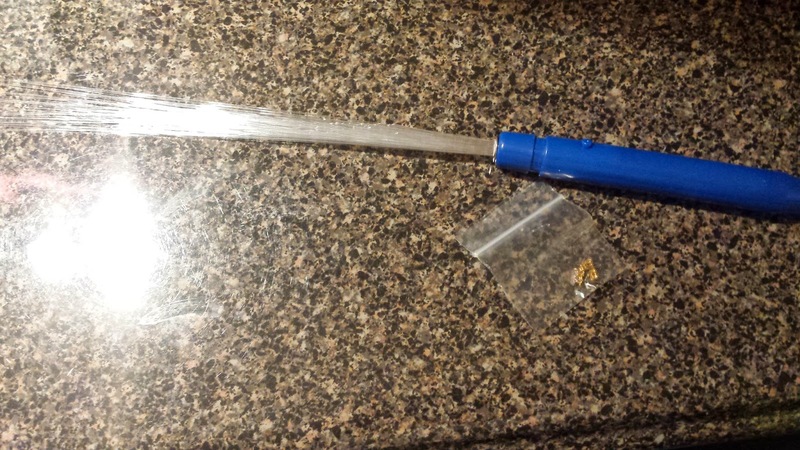 Originally, I was going to use a clear plastic peg to transfer the light up to the crystal. But, it didn't really work well. It did at first, but as the night went on, it seemed to be less and less optimal. At first, I was using a GW flying base peg, but the shape of it was fighting me. Then I found some clear plastic from a old X-Wing model that I've been meaning to finish. That worked well for a bit, but seemed to do less well after the green stuff was added. That's when I came up with the plan to use fiber optic strands and thanks to my folk's camping party supplies, I was able to get a novelty fiber optic light toy for free. The jewel was a freebie earring that my mom got down in the Caribbean. Supposedly, its a real gemstone of some kind, but I have no idea what it is. It worked out a lot better than looking for a plastic gem to use for the eye. The eye did require a bit more drilling in order to fit than I was expecting. I actually ended up drilling away at lot more of the face than I originally planned... But It was OK, as I filled in the gaps and hole with green stuff fairly easily. Once the Cyclops was drilled and the gem mounted, I got to work on his base. The lower half of the bust was made using a fancy wooden dowel, which I cut down to size. But I knew I'd need a pedestal for it to stand on, so after some digging, I found a old medicine bottle and pilfered the cap off of it. After a bit of work scraping threads off and covering other sections, we now have a base for the Cyclops bust! With the crafty stuff out of the way, up to this point, it was time to started with the painting. The Cyclops bust and the other busts were painted with a mix of white, bone and a flesh tone. While the base for the Cyclops bust was done with splattering greys and making it look like a granite of some kind. Since it's completely smooth, I had to fake cracks with black paint, which worked well. But that wasn't all that's been done so far. I found that while the fiber optic lights were great for transferring the light up to the gem, the LED's light had a tendency to illuminate the "stone" base from below... So to fix it, I painted the underside of the cap black and used an old pen and cut off a section of it to slide over the fiber optic. Now it makes for a really nice little light containment tube! 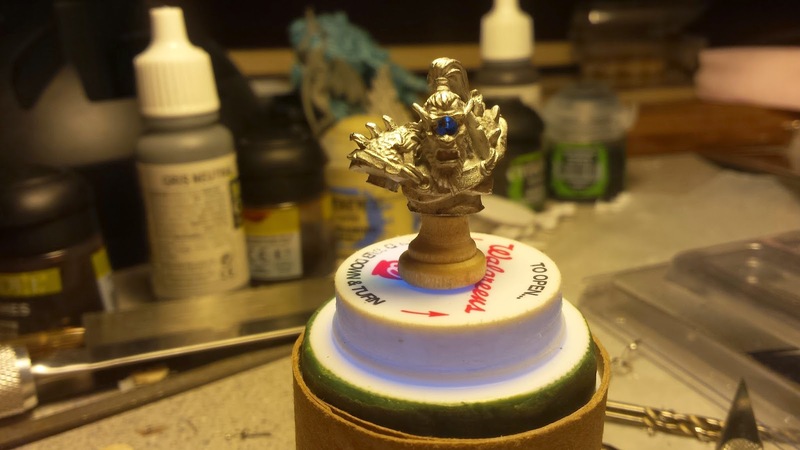 And finally, for this WIP post, I'm going to give you a little video of the bust in action! Please excuse the quality of the video, my camera is at least 7 years old and while it's a digital SLR, its more of a point/shoot and I have no control over the focus while recording video. I did edit out the sound though, so you don't have to listen to the annoying focus mechanism cranking continuously. That's it for now! 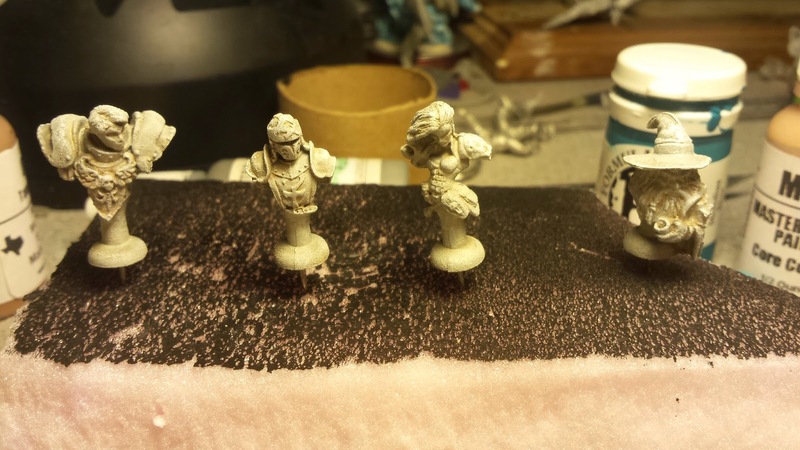 Progress moves forward, and I've moved on to prototyping the stands for the small busts. I am also currently waiting for a replacement mini from Reaper, because they sent me my order and missed one of the thieves. Once both thieves are in hand, I'll start painting them up. But I'm kind of really feeling the terrain building at the moment, and think I may be focusing more on that for the time being.